Playgrounds are fun and exciting places for the whole family. Your child has the opportunity to test her physical prowess while you play along or rest nearby. Playgrounds are great environments for your child to make new friends and learn important lessons. However, just like everywhere else in life, a playground can also be the location of conflict and disappointment. Helping your child learn simple rules of playground etiquette will set him up for success in these varied interactions. A busy playground frequently requires lots of taking turns. This can be very stressful for small children who want the playground equipment of their choice all to themselves. Remind your child that the playground is for everyone and that we need to be flexible and willing to share. This is important both when your child is using equipment and when they are waiting their turn. It is important to allow your child to take the responsibility to share. Saying something like, “It looks like this little boy wants a turn on this swing. When you are finished, it will be his turn. Can you think of what you’d like to do next?” This gives your child a chance to accept the transition and get excited about the next activity. It isn’t uncommon for your child to cling to that truck or doll as you head out the door to the park. 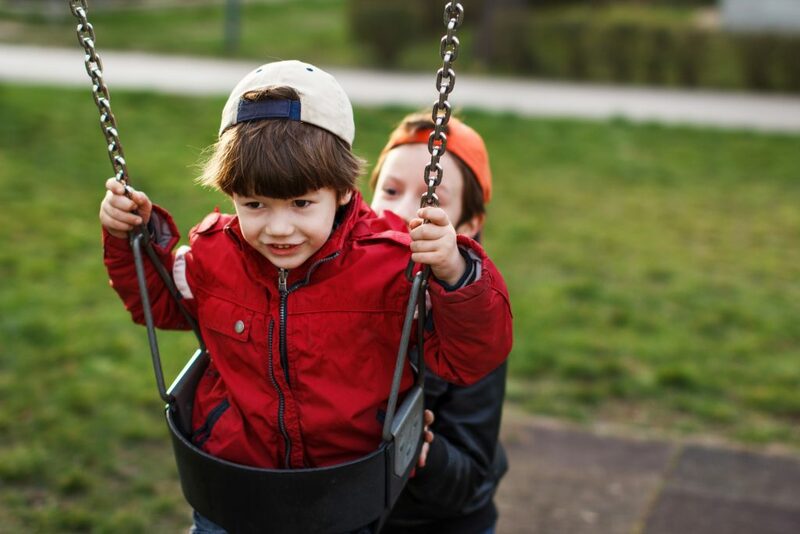 It is important that your child understands that bringing a toy to the playground means that it will probably be played with by other children. Give your child the option to leave their special toy in the car or bring it to the park to share. And if the toy becomes a source of contention on the playground, put it away in your bag or in the car. This allows your child to focus on enjoying play with friends rather than protecting something that is important to her. With many children on a playground (or even 2! ), there will inevitably be disagreement at some point. Encourage your child to ask his little friend for cooperation instead of competition. This could mean taking turns, choosing separate activities, or beginning a new game. Regardless of the end solution, the goal is for both parties to find a compromise. Whenever possible, encourage children to work through these conflicts on their own while you keep a watchful eye nearby. It builds both confidence and social skills to find a resolution. This may go without saying for an adult, but children often need to be reminded to use their words in heated moments. A quick reminder before releasing your child to play can prevent physical conflict. Granted, many children may not remember playground etiquette in the heat of the moment. In the case of a physical altercation, whether your child is the aggressor, victim, or a bit of both, take your child aside for a short break. This will give you a chance to connect, determine the extent of any injury, and make a plan moving forward. Depending on the scenario, the children involved may want to make up and continue playing or may need to stay separated for the remainder of your time. Regardless of the situation, your child faces challenges on the playground. Do your best to remain engaged and aware of what is going on as they play. This way you are ready with a hug, encouragement, or a quick rescue when it is required. Being a resource for your child as they play increases their security and confidence, allowing them to have a great play experience. Playgrounds are childhood staples, offer physical and relational challenges in a usually safe and fun environment. By discussing playground etiquette, expectations, and tools before you visit, the park will become a true joy for your child. For childcare that will continue this conversation with your child, providing encouraging support as they play, consider Legacy Academy Frisco. We take great pride in our quality, mindful care.